The rims are OE off my 2003 BMW 540i/6 Sport. They have a nice lip with a thicker lip on the rear rims for the staggered setup. These might fit other vehicles outside of an E39 5-series (1997-2003). One of the 17x9 rear rims is brand new. These rims are cleaned thoroughly every season after the winter and stored in my humidity controlled basement. The tires have approximately 5000 kms. 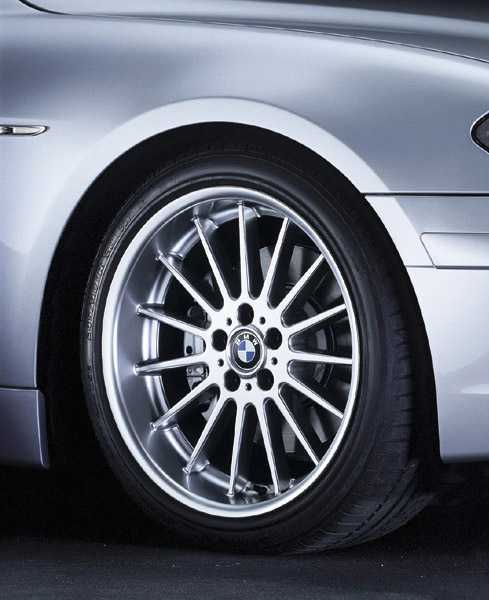 on them and are all in good shape - no uneven wear or camber wear that the BMW 540 puts on tires over time. The reason that I am selling these is because I want a set of 18s to replace these. I would like to get about $1500 obo for the set of rims/tires. The rims alone are $900 each, brand new from the dealer (BMW Waterloo supplied the new rim above). Last edited by speedemn; 12-22-2009 at 12:40 AM. Flav, get your head out of in between that teenage girl's knees and buy these. I am a bit flexible but I don't know how much... my replacements will cost more than double. Can you offer something in the ballpark at least? Honestly, even if they were perfect I couldn't offer you more than 1000. Few styles of rims go for 1k+ these days... I edited my email into the above post. P.S. Ivan, when you page someone you're supposed to PM them haha, I came into this by chance! !